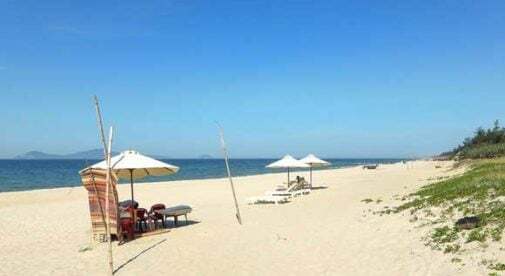 When visiting Hoi An, Vietnam there are some obvious must sees and do’s. You must visit some of the old cultural sites in the UNESCO World Heritage Ancient Town and you must have couture clothing and shoes made for a fraction of the price it would cost you to buy them back home. Renting a bike is easy in Hoi An. There are plenty of bike rental stalls on the sides of the street and a bike rents for between $1 and $2. It’s about a 15-minute ride to the beach, through rice paddies and veggie fields. As far as your eyes can see are the greenest and lushest paddies, and if you go early in the morning, you might get to see the mist lifting off them in the most magical way. It feels like you’ve stepped onto a movie set. You’ll see the workers in their traditional conical hat, nón lá, tending to the rice, and if you pull over for a photo they are pretty happy to pose. Once you get to the beach, there will be woman vying for you to come and sit in their beach loungers. For about $4 (depending on your negotiating skills) you can sit in that lounger all day and have someone bring you as many cold beers or drinks as you’d like. While on your bike ride, be on the lookout for water buffalo. The Vietnamese use them to work in the fields and care for them as pets, so you can often see them walking or eating on the side of the road. If you do, pull over, and you can pet and even feed them. They have curiously hard skin that’s covered in dirt and just stand there snorting hot air out of their nose as you feed them grass. It’s remarkable to be that close to such a beast. As night falls in Hoi An, a warm reddish glow envelops the city as the lanterns are being lit, and the lantern stalls are opening for business. These glowing pendants aren’t just for adornment; traditionally they were hung in front of every house and business to bring happiness, wealth and luck to whoever is inside. Wander through the stalls and buy a collapsible one to bring home or better yet, take a class and make your own. Hoi An has an absurd number of excellent restaurants catering to travelers. But the best food you’ll find is the fare the locals have been eating all their lives. If you find a group of them sitting on tiny stools encircling a small charcoal grill, join them. For the best cuisine in Hoi An, head to the many delicious street vendors and try the succulent BBQ pork spring rolls or skewers of pork. They may be eating BBQ pork spring rolls that you have to wrap yourself. For 40 cents not only will you get a tasty skewer of freshly grilled pork, but also a plateful of cucumbers, lettuce, herbs, and spicy, peanut sauce. For that price you also get a lesson in spring roll wrapping, which is rather helpful because it looks a lot easier when they do it; I shot some of my skewered pork into my husbands lap the first time I tried! Another great option is to go to Phuong Bahn Mi for a meat-filled sandwich that will cost about $1.10. The first rappel is the easiest at 22 meters and gets your blood pumping a bit as you walk backward off a cliff while looking at the ocean. The second is only 15 meters, but this time you walk off into a dark cave that was used for worship and as a hideout for the Viet Cong during the war. The final rappel is a long 50 meters into a pitch black abyss. It’s too far to see the bottom, so you have zero idea when or if you are close to landing. When you finally touch the ground again, you realize you are in a temple with fully preserved deities and shrines. It is other-worldly. Simply provide your email address in the box below to receive your free report. 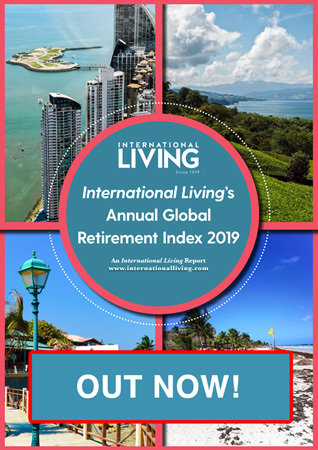 You’ll also receive a free subscription to our International Living Postcards–a daily e-letter that explores living, traveling and investing in Vietnam and other exciting countries around the world.